A thread on Apple's support forum has been filling up with complaints of a software update leaving many Apple TV players without network connectivity - or worse yet, bricking the hardware entirely. Although the issue dates back to September when the Apple TV version 5.1 software update was first released, an increasing number of users appear to be afflicted by an issue that renders their media streaming box useless. 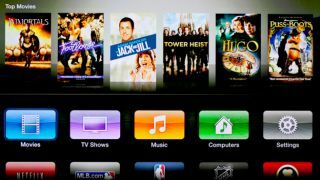 AppleInsider reported Tuesday that afflicted users posting to Apple's Support Communities website describe the problem as a black screen shown on the connected HDTV, while the light on front of the Apple TV continually blinks. For those lucky enough to get their Apple TV to actually boot up, many are discovering the media play is unable to connect to their network after applying the latest update. As users continue to flock to the support thread to complain about the issue, others have proposed a temporary solution. Apparently, manually downgrading an afflicted Apple TV to an earlier version of the software appears to get things working again - at least until Apple comes forth with an official remedy to the problem. Apple forum member the FeverDog posted links to the previous Apple TV 5.0.2 update for both second and third-generation models, but that version doesn't include support for Shared Photo Streams or sending audio-only content to AirPlay-enabled speakers. To install the downgrade, users must first download an IPSW file from Apple's servers, which can then be used to restore the Apple TV via iTunes on a Mac or PC with a micro-USB cable.